It was Friday in January, and the patient flow to the emergency department of the Church of God hospital in Saintard, Haiti could be described as typical, but busy: a man whose finger had been severed by a machete, a child who had been vomiting for a couple of days and was dizzy and a bit dehydrated, an elderly lady who had experienced a stroke, a mom who was in the early stages of labor, and a man who had fractured a femur from one of our many motorcycle accidents. The load of patients kept the small staff of the ER quite busy, as the outpatient department across the courtyard, the optometry department, radiology, laboratory, vaccination area, intake staff, and the many support personnel buzzed around managing the daily patient load. In the early afternoon, a pick-up truck sped to the door of the ER. Stacked in the back of the truck were three men, bleeding, moaning, and in various states of consciousness. The passengers and driver of the vehicle quickly described that an accident had occurred about a mile from the hospital and more victims were on the way. The next vehicle arrived and then the next, and then the hospital’s transport vehicle traveled to and transported from the accident scene until all eight of the injured arrived and quickly overwhelmed the two nurse, one physician staff managing the ER. I normally prefer that the Haitian staff at the hospital take care of the daily routine, but they came and asked if I might lend a hand. Entering the area where patients were arriving, I noticed that the security guards were donning gloves and had already asked permission of the ER staff to move some of the patients to another part of the hospital, since all ER beds were full. They quickly did so and then other beds were wheeled into the area to hold the newly arrived injured people. The physicians and nurses from the outpatient clinic and staff throughout the facility stopped what they were doing and soon there were two more physicians, two more nurses, and even a few from the Saintard community who were waiting with sick family members, who helped to move patients around to other beds in the inpatient area of the hospital. The small ER was buzzing with activity and another of our staff, who was leaving work at the time, came back to help, as did some of our lab techs. Pressure was being placed on wounds, fractures were being stabilized, IV’s and pain meds were being administered and in general it looked like a scene from a re-run of M*A*S*H.
I was working with the most seriously injured patient, a young man in his early twenties. He was quickly deteriorating, in spite of what we could do. Soon, I found myself doing chest compressions as the defibrillator was attached. After a few minutes of doing all that we could do, we all stubbornly agreed that this would be the first casualty of the accident. Moving on to the next patient and then the next, the staff of the hospital used what resources that were available to patch, splint, x-ray, medicate, and stabilize each of the victims. Wounds were still in need of suturing, fractures were in need of surgery, and transports to larger facilities still needed to be done in our one bed-equipped transport vehicle, not in the back of a pick-up truck. There was still a lot of work to be done, but the initial assessment had passed and the staff started to dissipate back to their regular jobs at the hospital. The patients were, at the moment, stable. Toward the end of the ER “push”, the mom who had begun labor prior to the influx of accident victims began to show signs of more advanced labor. As I left the hospital for the day, the family of the one accident fatality had arrived at the facility. The all too familiar survivor’s wail cut through the air and entered into saddened hearts. The family of the mom in labor sat near the grieving family and waited with anticipation of a new life in their midst. 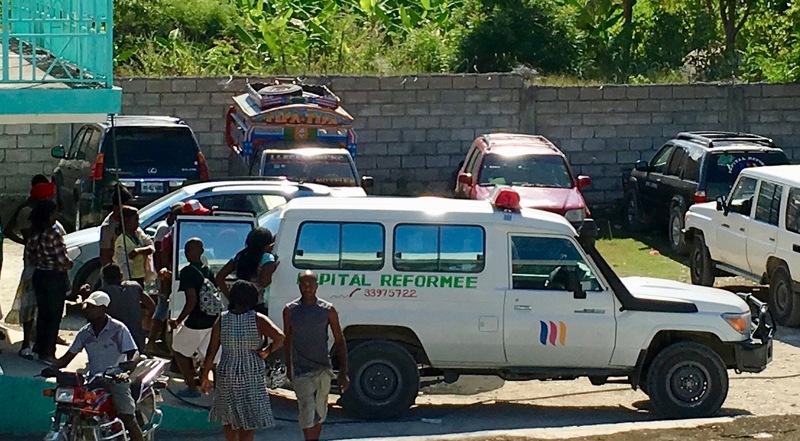 The antithetical emotions seemed as if they should not belong at the same facility concurrently, but somehow they defined the “normal” so many times in Haiti: such tragedy juxtaposed against so much joy. As Kathy and I drove back toward our home that Friday evening, we didn’t talk that much, even though the traffic snarls kept us in the car about an hour and a half longer than normal. Sometimes, we grow tired. Sometimes we are overwhelmed. Sometimes we wonder why in the world we just aren’t sitting in our living room in the US watching M*A*S*H re-runs instead of living them. As we have time to catch our breath, and reflect on situations such as this we realize and learn many things: we are thankful for the staff that God has provided to care for situations like this accident, we are thankful for the so many people in the US who have donated so the facility can even be available to the public, we are thankful that the generator was working so that we could take x-rays, we are thankful that we had medicine to help with infection and pain, we are thankful for God’s provision. The overworked, underpaid staff of Hôpital L’Eglise de Dieu Réformée deals with situations like this all of the time, utilizing what limited resources they have to make the best of each situation. They have my admiration and my gratitude. Most of all, however, I am thankful that God has provided so many of His people to come together to form the beginnings of a beacon of hope to those in need in the underserved Saintard area. May these hard lessons allow us to grow and to be more determined to serve God and others to the best of our abilities. Madam Wilbert Petit prays for a patient before surgery. 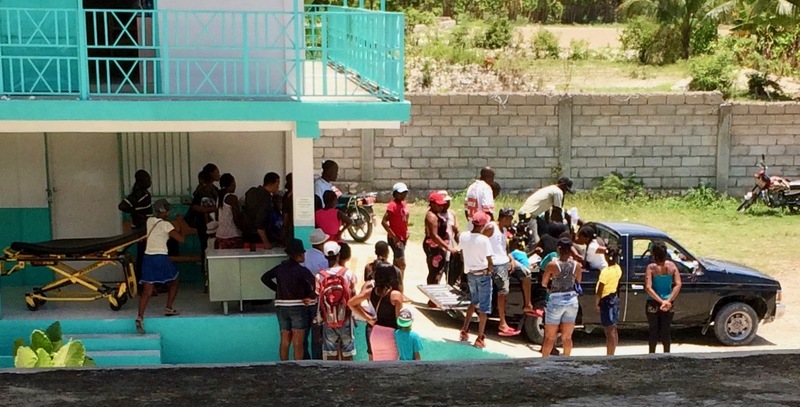 © 2019 Mission Haiti Medical. All Rights Reserved, Higgs + Co.